Held each year just before the Hell of the North, Paris-Roubaix, this race nonetheless bears little resemblance to that famous race. It’s a 60km race over lumpy terrain just south of Hobart, Tasmania, and has no cobbles. I had not planned to do this race. I had looked wistfully at the weather forecast and then my wife surprised me by encouraging me to go. Bear in mind that we have a one month old little boy, and so sleep, fitness and all the usual things necessary for riding competitively were somewhat out the door, and so it was a big gift from my wife for me to go and ride. Still, I did jump at the chance to ride. My last race had been about a year ago, and I had really enjoyed it. I figured I’d struggle today but decided to go along, give it a crack, and just make the most of the opportunity. The weather was grand: warm, a light breeze, and overcast meant dry roads and a pleasurable ride whatever happened. It also meant there would be a decent turnout, and we had nearly 20 starters in B Grade. 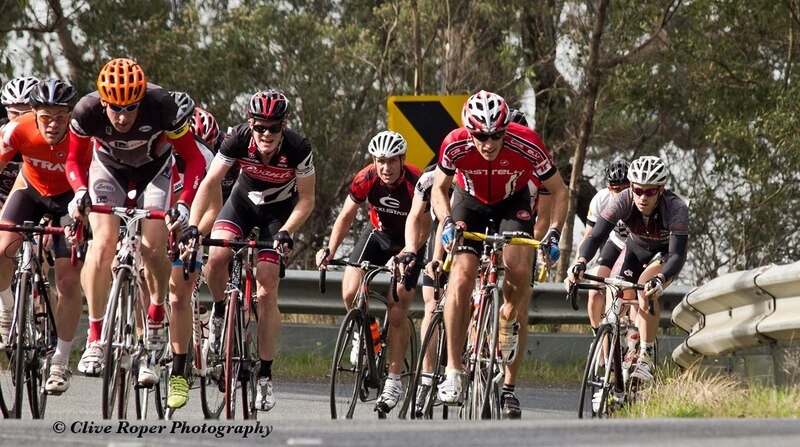 I chose to ride B Grade, mostly because my mates would never let me live it down if I sandbagged in a lower grade! C grade proved just how somnolent that pace really was when they roared past us and made the whole grade feel deeply ashamed of their lacklustre efforts thus far. B grade subsequently made up for this by surging back past C.
However C Grade were not done yet. They came back past B Grade and their efforts were probably solely responsible for a respectable pace in the bunch up the first real climb. Barry rode off the front a little up the climb, but we all knew he wasn’t silly enough to try and solo the entire race, so no one panicked. At this point, my legs were a little heavy but I was doing fine. Dogga and I had been a little silly on Thursday with a well-over-threshold attack up the lower slopes of Strickland Ave, and while I suffered somewhat from this, I think he suffered more! The next 40 or so kilometres proved to be all over the show. A dog’s breakfast. A shambles. A few half-hearted attempts to setup a pace line were tried, and some even more half-hearted attacks followed, but mostly it was just surge followed by soft pedal! This meant the final climb would be intense. Everyone was saving their bikkies for the Nicholl’s Rivulet climb. Everyone except for me. I was just hanging on, using tactics like drifting from the front to the back of the bunch on the little climbs, and feeling very aware that my longest rides recently had been only 30km or so! Once through Kettering, the pace started to hot up a bit. 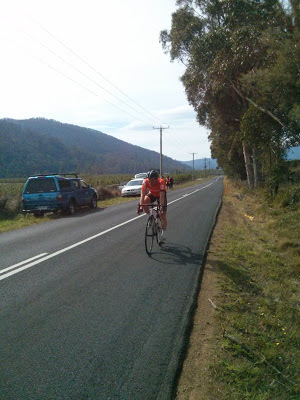 A 1.2km climb at 6% sorted out the candidates from the pretenders. Me, a pretender for sure as I watched the bunch get 5 seconds — doesn’t seem like much, but was enough to make it very hard indeed to get back on. Through the turn onto the Nichol’s Rivulet climb, just a few seconds off the back and I could feel my legs telling me “enough”. I struggled to rejoin the bunch but never really made it back. I plodded up the final climb, with a few other riders ahead and just out of reach. Over the top and decided that I would give it all I had on the descent and flat run into the line — not that I’d catch the leaders, but at least I could be somewhat satisfied with the day’s efforts! I managed to catch Sam, but Brendon and one other rider remained tantalisingly out of reach. Adam (congratulations, I understand, are in order), Joe, Mark, Barry, Jonathon, James, Mike and others were even further up the road!